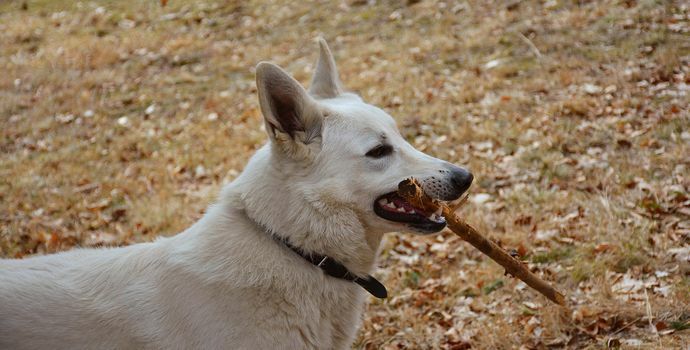 Throwing a stick for your dog to catch seems like an ideal way to spend the day. After all, entertaining your pet, out in the fresh air, people have been doing it for centuries - so what’s wrong with it? All the people who keep telling us not to, are they spoilsports? Is it “health and safety gone mad”? Sadly, the answer is no - although it is true that a lot of dogs get away with it, throwing a stick for your dog is genuinely dangerous. You only need to see one nasty case of a dog who’s been badly injured - or even killed - to realise that. In this blog, we’re going to explain why, in the hope that your dog isn’t the next one we see on our operating table, while the owner wrings their hands and says “we never thought it would happen”. The problem is three-fold; firstly, sticks are irregularly shaped objects, and because of the way they break off the tree (oblique breaks and/or greenstick tears) they usually have a sharp and pointy end. While you’re holding them, the risk is minimal (after all, you’re unlikely to stab your own dog). However, the second problem is this - when you throw a stick for your dog, as soon as it leaves your hand, it’s out of your control. The stick will fly until it hits the ground (or a hedge or whatever, or is caught by the dog). When it lands, in most cases it will lie flat on the ground - but in a surprisingly high percentage of cases, it gets stuck in the ground leaving a pointy end sticking out, many dogs are overexcited by the game, and some will run onto the stick, impaling themselves. This isn’t a theoretical risk - it happens all the time. The third problem is that wood is prone to splinter. Once embedded in your dog’s flesh (or even if grasped firmly in their strong jaws), splinters of wood become detached and bury themselves in the tissues. These are not only hard to remove, but they can be hard to detect (wood doesn’t show up on X-rays), and usually carry infection deep into the tissues. When a dog crunches a stick, the most likely result is a mouth full of splinters. Although rarely life-threatening in the short term, every single one needs to be removed or else they will suppurate, leading to abscesses and severe infection, that may even be fatal. This usually means having them in to the surgery, and carefully removing every last splinter under anaesthesia. Firstly, do not try to remove the stick. It may well be that the foreign object in the wound is preventing fatal bleeding. Instead, get them to us as rapidly as you can. What can I do to keep my dog safe when playing? Simple - don’t throw sticks! Instead, invest in a safe toy, like a large ball, a Kong Wubba, or a rubber stick (e.g. Rosewood’s Stikz). We really, really don’t need any more dogs injured in this way! If your dog is injured, or you’re concerned that they might have a splinter, call us straight away for advice!